The laboratory is in the Section of Histology and Embryology of the Dep. of Biomedicine and Prevention, Faculty of Medicine and Surgery, University of Rome Tor Vergata. Primordial germ cells (PGCs) are the founders of the gametes. They arise at the earliest stages of embryonic development and migrate to the gonadal ridges,(GRs) where they differentiate into oogonia/oocytes in the ovary and prospermatogonia in the testis. One of the most fascinating characteristic of these cells is their double nature of highly specialised cells that, at the same time, maintain their differentiation totipotency to pass on to gametes. How this is realised is not known. However, over the last two decades important aspects of PGC development and differentiation have been revealed. In the mouse embryo, a cluster of about 50 PGCs can be detected using histochemistry staining for alkaline phosphatase enzyme or other markers (i.e. BLIMP1, Oct4) in gastrulating embryos around 7-7.25 days post coitum (dpc) in the extraembryonic mesoderm at the base of the amniotic fold. From this region, PGCs spread into the mesoderm of the primitive streak, and the endoderm of the yolk sac and hind gut. At 10 dpc, they begin to move by active migration up the dorsal mesentery and into the GRs where, they differentiate into oogonia/oocytes and prospermatogonia in the ovary and testis, respectively. In the human embryo, PGCs can be recognised at around 3 weeks of gestation in the mesoderm/endoderm of the yolk sac. Following the morphogenetic movements of the embryo during the 4th week they enter into the embryo engulfed in the wall of the hind gut. Between 5th-6th week they migrate from the gut tube via the dorsal mesentery to the gonadal ridges. PGCs continue to multiply by mitosis during their migration and after arrival into the gonadal ridges. Around the end of 6th week testicular differentiation of the gonads become apparent with the formation of testicular cords by differentiating Sertoli cells; PGCs can be now called prospermatogonia. Similarly, in the female proliferating PGCs within the differentiating ovary (8-26 weeks) are called oogonia. Over the last more than two decades the laboratory has contributed to develop methods for isolation, purification and culture mouse PGCs and to elucidate several aspects of PGC development in the mouse. Carrying out studies started in the early eighty years, at the Mammalian Developmental Unit in London under the guide of Anne McLaren, M. De Felici and his collaborators evidenced the crucial importance of certain cytokines such as LIF and SCF for preventing PGC apoptosis and sustain their survival. 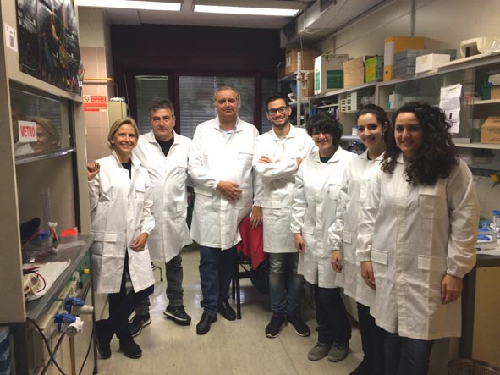 They also focused on characterizing adhesion molecules expressed in PGCs and performed the first studies aimed to elucidate their role in PGC migration. The search for compounds able to regulate PGC proliferation, led the laboratory to identify cAMP, retinoic acid and the PACAP neuropeptides as PGC mitogens. These findings served as base for studies that led P. Donovan’s and B. Hogan’s laboratories to the important discovery that PGCs can be transformed in culture in ES like cells termed EG cells. The regulation of the beginning of meiosis in female PGCs and the role of BMP4 in the formation of PGCs from the epiblast have been other topics to which lab researches have been devoted. 1. 5-6 days post coitum. 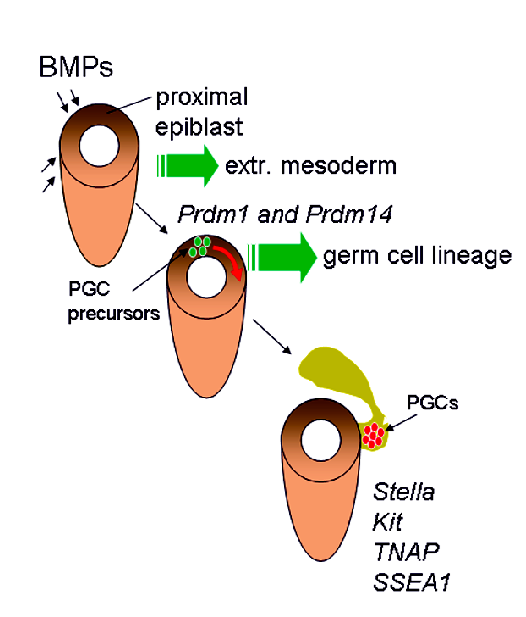 Cells located in the proximal epiblast are primed to the extraembryonic mesoderm differentiation by BMPs , in particolar BMP4), secreted by extraembryonic ectoderm and endoderm. 2. 6.25-6.75 days post coitum. 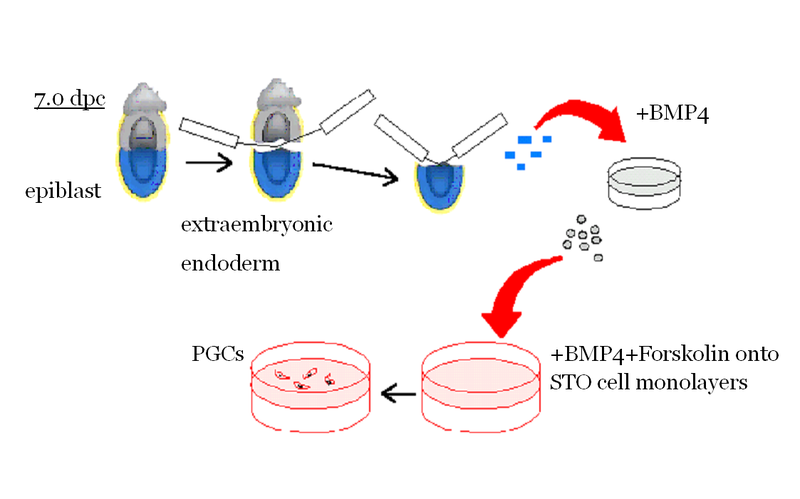 Six cells ex pressing Fragilis and E-Cad located in the posterior region of the epiblast receiving the highest dose of BMP2 and ex pressing SMAD1-5 are restricted to PGC lineage following PRDM1 (Blimp1) and PRDM14 expression. 3. 7.0-7.25 days post coitum. PGC precursors move into the extraembryonic mesoderm at the base of allantois where they are determined as PGCs. In 2002, studies carried out in the lab confirmed and extended the notion coming from other contemporaneous studies of the crucial role of BMP4 in the formation of PGCs from the epiblast. The scheme represents a two step experiment carried out to produce PGCs in culture. 1. 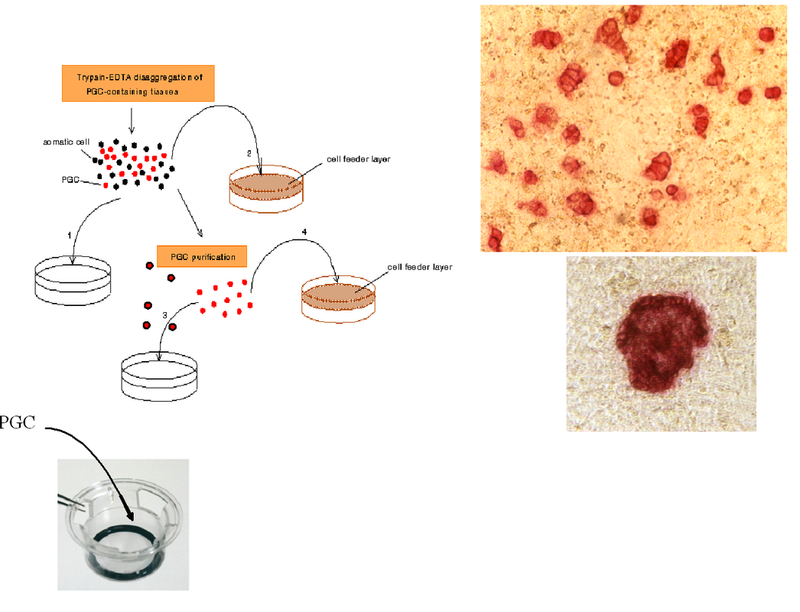 Culture of tissue fragments of epiblast-extraembryonic endoderm in the presence of BMP4 for 2 days and 2. culture of the cells obtained from the monolayers grown in culture in the presence of BMP4 and Forskolin for additional 2-3 days onto STO cell monolayers. Many questions are still open about the mechanisms of PGC migration in mammals. How is PGC motility activated? What guides PGC to the gonadal ridges? What controls PGC homing? The existence of chemoattractant/s produced by the gonadal ridges has been long hypothesised. 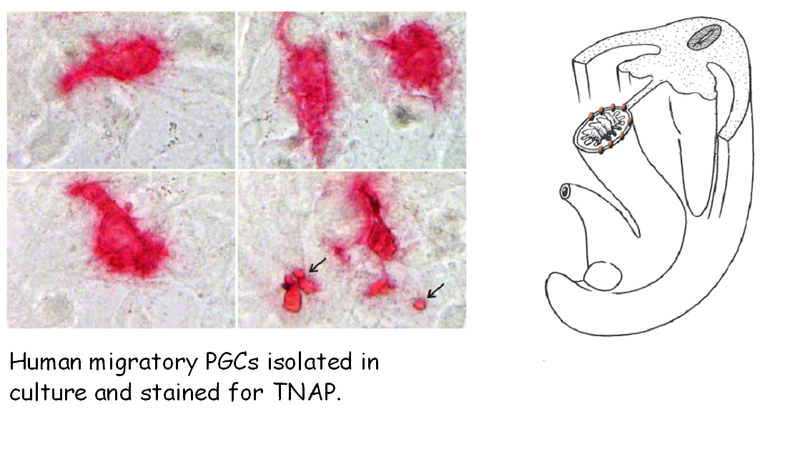 Some indications exist that in the mouse TGFß and SDF-1 could be PGC attractant. In a recent paper, we presented results suggesting that Kl (o SCF) itself, a well known survival/proliferation factor for mouse PGCs, is also able to exert chemotactic attraction on PGCs (D. Farini, et al., Dev. Biol 306, 572-583, 2007). Certainly, interactions with ECM molecules (i.e. fibronectin and laminin) via integrin receptors (i.e. ß1) are crucial for PGC migration, but through which mechanisms it remains to be elucidated. Also specific oligosaccharide chain present on the PGC membrane may play a role in their migration. Interestingly, it has been observed that most PGCs migrate in cluster taken together by E-cadherin. All together, these results indicate that PGC migration results by coordinated interactions with ECM molecules, somatic cells and PGC-PGC occurring via multiple adhesion systems. Using a relatively simple method based on EDTA and mechanical disaggregation of gonadal tissues, it is possible to obtain enriched PGC population from post-migratory stages (12.5-13.5 days post coitum, dpc, embryos). Moreover, the use of a discontinuous Percoll gradient allows increasing the purity of such PGC populations up to 80-90%. The availability of monoclonal antibodies able to bind to PGC surface molecules (SSEA-1, EMA-1 and TG-1) and the introduction of magnetic cell sorting techniques allowed to develop more efficient methods for purification of PGCs from both migratory (10.5-11.5 dpc) and post-migratory (12.5-13.5 dpc) stages . Methodological details, advantages and pitfalls of these methods can be found in De Felici (1998). Other methods for PGC purification include fluorescence activated cell sorting (FACS) of EMA-1 labelled or ß-gal or GFP expressing PGCs. 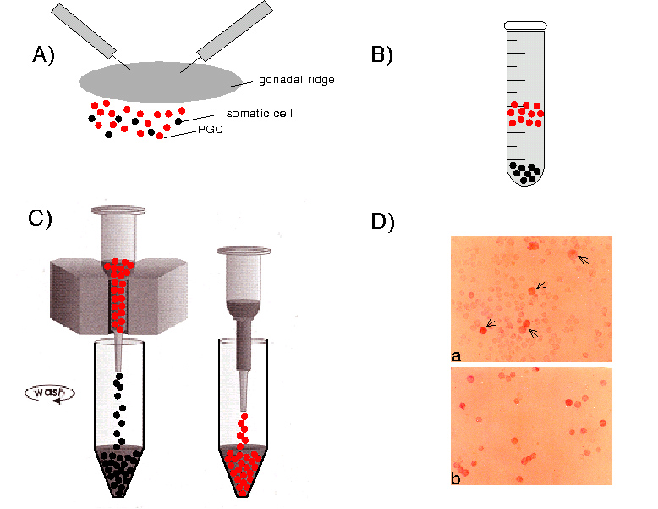 Schemes of the three methods devised in the lab for the isolation of mouse PGCs. A. EDTA-puncturing, B. Percoll gradient and C. Immunomagnetic selection. In D, a. and b., 11.5 dpc PGC containing cell populations before and after immunomagnetic selection. 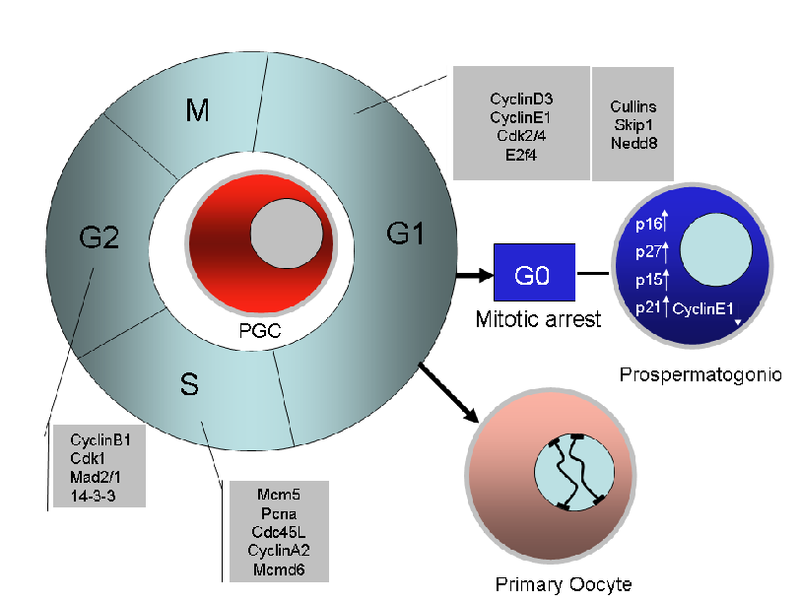 A diagram showing the main cell cycle genes found to be expressed and likely to control cell cycle in proliferating mouse PGCs (data are based on the papers of Sorrentino et al., 2007, Western et al., 2008 and some our unpublished observations. Our studies have shown that cAMP or cAMP agonists such as forskolin (FRSK) markedly stimulate PGC proliferation. Molecules that may stimulate in vivo the intracellular cAMP increase in PGCs, have not been identified yet. We have found, however, that, among many peptides known to increase intracellular cAMP via specific receptors, pituitary adenylyl cyclase activating peptides (PACAPs) are able to stimulate in vitro proliferation of PGCs. In addition, we reported evidence about the presence of these peptides in the fetal gonads. Another compound that showed to be able to significantly increase the proliferation rate of PGCs was retinoic acid (RA). RA added to the culture medium in the range of 1-5 µM, promoted PGC proliferation on feeder layers of both their own gonadal somatic cells and of TM4 or STO cells. Thanks mainly to the use of two in vitro culture systems, PGCs co-cultured on feeder layers of their own gonadal somatic cells or of established cell lines, survival and/or proliferation factors needed for PGC development were discovered. The leukemia inhibitory factor (LIF) was the first growth factor identified in our lab as able to significantly increase PGC survival in vitro. A second growth factor found to exert a very important action on PGCs was the stem cell factor (Kl or SCF). In 1991, Susanna Dolci, working with the P. Donovan’s group at Frederick, showed, simultaneously with other laboratories, that SCF is essential for PGC growth in vitro, and that the PGC life-supporting activity of certain feeder cells is partly due to the production of such growth factor, in particular of the SCF membrane-bound form. In our lab, we apply for the first time the notion of the apoptotic degeneration to PGCs and found that the addition of SCF or LIF to the culture medium markedly reduced apoptosis in PGCs during the first hours of culture. More recently, we have shown that the effect of SCF on PGC apoptosis is, at least in part, due to a reduction of the expression of the pro-apoptotic gene bax. The finding that isolated PGCs begin to undergo apoptosis a few hours after isolation from the gonadal ridges, gave finally an explanation of their rapid degeneration in culture. It is well known that in mammals oocytes begin meiosis during fetal or early postnatal life in the ovary, while in male the first germ cells which enter leptotene stage are normally first seen in the young pre-puberal testis. Byskov (1974) suggested that a diffusible factor produced by the fetal rete ovarii (the meiosis-inducing substance, MIS) is involved in stimulating meiosis in the female. 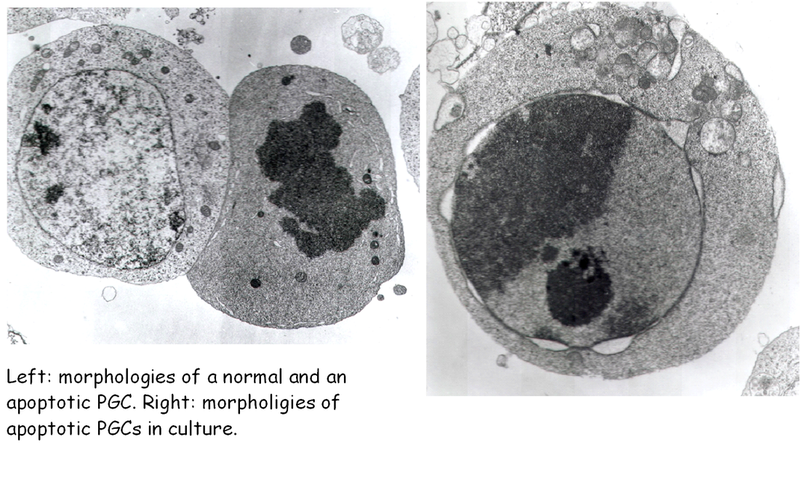 The reason why meiosis does not occur in male fetal germ cells has been explained by the action of a meiosis preventing substance (MPS) produced within the seminiferous cords (Byskov and Saxen, 1976; Byskov, 1978). Other observations favor the view that germ cells are intrinsically determined to enter meiosis unless they are prevented from doing so by being enclosed within the seminiferous cords of the testis. In 1990, De Felici and Dolci (Development 109, 37-40) approached the problem by producing in vitro chimeric mouse fetal gonads. Whereas most of donor 12.5 dpc female germ cells appeared able to enter meiosis within host ovarian tissues only a small number were in meiosis in chimeric testes. None or very few of donor male germ cells entered meiosis in ovarian host tissues. Aggregation of meiotic 13.5 dpc female germ cells with testis tissues from 13.5 to 14.5 dpc embryos resulted in inhibition of meiotic progression and pyknosis in most donor germ cells. These results support the existence of a meiosis preventing substance or a factor causing oocyte degeneration in the fetal mouse testis, but not of a meiosis inducing substance in the fetal ovary. More recent results, however, supported the early Byskov evidence indentifying retinoic acid as the MIS produced by the rete ovarii. Using the culture method for isolated PGCs recently devised in the lab (Farini et., 2007, Dev Biol 306, 572-583), we hope to contribute to clarify some of such controversies. In particolar, we are now studing a protein called STRA8 believed to play a crucial role in the beginning of meiosis. De Felici and McLaren in pioneristic studies observed that germ cells isolated from embryonic gonads of different ages have different abilities to survive in vitro. The use of feeder layer culture, certain growth factors and compounds gradually led to improvements in PGC culture and to establish conditions that allowed PGCs not only to survive in vitro for several days, but also to proliferate. Several groups found that a combination of compounds (Forskolin, RA) and growth factors (SCF, LIF, bFGF), in certain culture condition, may lead to prolonged proliferation of a small population of PGCs and their transformation into totipotent ES-like cells, named embryonic germ cells (EG cells). A crucial enzyme involved in PGC trasformation in EG cells seems to be PTEN, a lipid phosphatase able to reduce the level of the phospholipid Pip3. 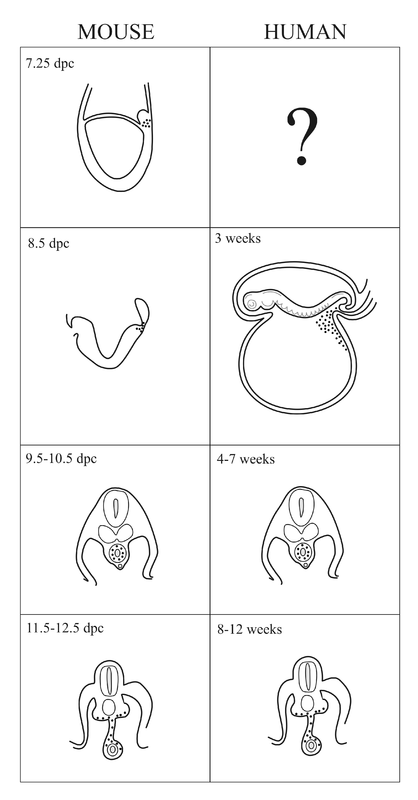 development of embryos obtained from transplanted EG or EG cell nuclei. We have devised a new method and culture conditions that allows for the first time to culture PGCs in the absence of somatic cells to enter and progress into meiosis. We hope that this will allow understanding the mechanisms governing the crucial switch between mitosis and meiosis (Farini et al., Dev. Biol., 2007).